Human beings have evolved for the past 1.8 million years to be affectively connected – a baby responds to the mother and the mother responds to the baby. As many researchers and clinicians have been highlighting, a mother and a baby are a dyad and from before the baby is born, and certainly after, an affective connection is being formed. What happens, though, when something goes amiss? As we work with new parents – mothers and fathers – it is important to remember that up to 85% of new parents experience perinatal emotional distress and that one in f peripartum women experience a Perinatal Mood or Anxiety Disorder. This means that there can be a significant disruption to the usual attuned and synchronized affective communication between the baby and the primary caregiver (usually the mother). In this online training, we address a wide range of evidence-based and best practice approaches, including interventions that address acute distress and problem-solving as well as approaches that facilitate growth and transformation. Here are some clues to what we discuss in the online training and clinical tools that clinicians at Seleni have found useful. When new parents are in a crisis situation, it is imperative to find solutions for significant problems such as impaired sleep or acute anxiety. However, from the first moments of the therapeutic encounter, researchers and clinicians are recognizing the critical importance of engaging in an attuned process of therapeutic holding. Forming a therapeutic relationship and accurately responding to verbal and nonverbal responses as well as creating an empathically based therapeutic alliance is at the heart of effectively helping new parents regain their equilibrium and wellbeing (American Psychological Association, 2006). Therapeutic holding reflects an affectively attuned, right brain-to-right brain therapeutic approach that facilitates safety and mirrors the dyadic relationship between a mother and her baby. The affective (emotional) centers of a healthy baby’s right brain are fully formed at birth and as the baby and the mother engage, the affective connection and attachment between the mother and the baby begins to form. Schore and Marks-Tarlow (2018) note that the dyadic relationship has evolved so that a baby paces interactions with the mother through “beguiling wriggles, coos, and smiles” (p. 70) and that there is a dyadic and synchronized communication between the baby and the mother. This communication starts as early as when the baby is 8 weeks old. Thus, the two-way story of dyadic love starts and both the baby’s right brain and the mother’s right brain are activated. Winnicott (1975) describes these first weeks as the emergence of “quiet love,” that is, love that is activated mainly through the gaze and attuned caregiving. Quiet love evolves and is the base for an engaged and mutual love between the baby and the primary caregiver (usually the mother). Just as the primary caregiver and the baby form an affective bond, mutual love, and attachment, we (clinicians), too, need to listen and provide care that mirrors the care between mother and baby, care that is based in right brain-to-right brain affective connections and that activates an affectively based therapeutic alliance. And, just as an infant – from the start of life – thrives on mutual love, those with whom we work also can thrive through an intentionally and affectively grounded therapeutic relationship, one that from the first point of contact is attuned to the new parent’s internal states so the clinician is able to flexibly modify and synchronize responses while working with the new parent. As the therapeutic alliance – the attachment between the clinician and the new parent – is established, it also resonates with the new parent’s original infant-mother attachment (rooted in right brain-to-right brain unconscious processes). Schore (2018) writes that “effective psychotherapeutic treatment…facilitates changes in the complexity of the right hemispheric unconscious system” (p. 42). When a parent comes to us: listen to the story. Assume nothing. There are many myths surrounding parenthood and pregnancy and motherhood. While new parenthood does not always result in a PMAD, it is not always a time of bliss. Internal representations shift; identity shifts; and ambivalence can be a confusing if normative part of many new parents’ experience. There is often a big learning curve: moving from knowing how to carry out the demands of life to being a beginner and needing to learn everything that’s needed to care for and keep this tiny new human being safe. Confounding this difficulty is that many new parents believe the societal myth that pregnancy and the peripartum time should be blissful. Many new mothers – and fathers – find that being a new parent is really hard. It can feel shameful and be an alienating experience to have scary and distressing intrusive thoughts, which most parents have, such as, ‘what if I drop the baby?’. Many new mothers are terrified to tell anyone about these thoughts or to discuss their rage or ambivalence or boredom because they are afraid they will be considered an “unfit mother” and their baby might be taken from them. Often new parents are truly relieved when they realize that they are not alone in having these intensely distressing emotional experiences and find that naming them can be an important first step in bringing about real change and recognizing that hope is possible. It is important to recognize that there is a wide range of normative emotional distress in the peripartum time. For example, after giving birth, most women experience “baby blues,” or postpartum reactivity.bab and in part is the result of the biggest hormonal drop a woman will ever experience. Most women experience some degree of physical discomfort along with emotional disruption immediately after giving birth. However, “baby blues” usually resolves within ten days or so. It is important for new mothers to know that in the first days after a baby is born, some emotional lability and distress is normative. It is also helpful to tell those with whom we work that up until recently, perinatal emotional distress – from mild to severe – was referred to as Postpartum Depression or simply “Postpartum,” primarily suggesting depressive symptoms or a depressive episode in the postpartum time. Now there is growing awareness that what was considered to be “Postpartum” or Postpartum Depression actually covers a wide range of perinatal emotional distress. 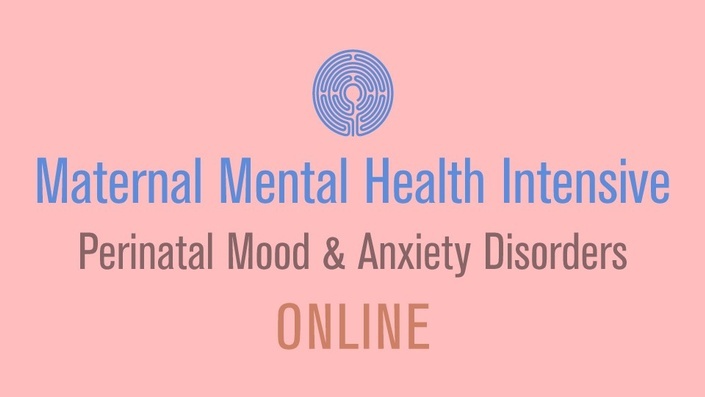 What more accurately captures the range of perinatal emotional distress is the phrase being used now, Perinatal Mood and Anxiety Disorders (PMADs). PMADs encompass Major Depression, Generalized Anxiety, Obsessive-Compulsive Disorder, Panic Disorder, and Posttraumatic Stress Disorder. Significant emotional distress or a PMAD can occur in pregnancy and up to a year postpartum. Also, many perinatal women experience an overlap of symptoms from several of these disorders, such as having depressive symptoms along with anxiety and obsessive thoughts. It is important to discuss an assigned diagnosis and clarify that we have specific ways to work with each kind of distress. Many new parents have expressed relief while having this discussion: “There’s a name for this. And I can get better.” Educating new parents experiencing perinatal emotional distress or a PMAD is also part of therapeutic holding because it can help new parents rediscover and ground themselves as they shift their identity and recover. It is crucial to include the body as we work with a perinatal woman. Sleep is so important. Sleep provides resilience and the capacity to tolerate emotional ups and downs. However, getting quality sleep in pregnancy can be challenging. And, sleep deprivation is almost a hallmark of new parenthood. So, it is important to address sleep restoration because sleep deprivation can intensify emotional distress such as anxiety or panic or obsessive thinking and can make it more difficult to tolerate emotional ups and downs. Sleep disruption also can be a sign that a PMAD is developing. Sleep restoration is also key to recovering from a PMAD. Getting good sleep is challenging! It’s important to remember that the quality of sleep is more important than the quantity of sleep. It can help to discuss setting up what is needed during the night for feeding and diaper changes while using the least amount of light possible (so the new parent doesn’t wake up too much!). In addition, it can be helpful to create some kind of routine before going to bed to make the body “hungry” for sleep. The question of naps is important to address because many new mothers are told to “sleep when the baby sleeps.” While this can be a good suggestion for a mother who was able to nap before the baby was born and now is able to sleep while the baby sleeps, it can be devastatingly anxiety provoking for new mothers who are not able to nap or sleep when the baby sleeps. The question of napping or simply resting when the baby is sleeping needs to be custom designed with each new mother. However, it can be profoundly helpful for a new mother to get one uninterrupted time of sleep at night. Explore the possibility of her getting help from family, friends, night nurses, doulas, or her partner. One of the more challenging suggestions to ensure good quality sleep is to limit the use of electronics that emit LED light in the hour before sleep (or in the night) because that light tells the body, “it’s daytime. Time to wake up!” If it isn’t possible to limit the use of electronics (such as a smart phone or an IPAD), it can be a useful to set the display and light level to a warmer end of the color spectrum (and most smart devices have a “night” setting). And, avoiding caffeine late in the day also can be a way to enhance the quality of sleep. Getting good quality sleep can jumpstart recovery as well as stretch a new mother’s emotional capacity and resilience that can help her embrace the unexpected that comes with being a parent. Researchers and clinicians have clearly established that regular exercise helps enhance mood and reduce anxiety. Exercise can reduce depressive symptoms of moderate depression as effectively as medications such as SSRIs. It is always important to make sure that a new mother’s healthcare provider has cleared her for exercise. And, while it can be a challenge to get started exercising, taking even small actions, such as a short walk to the corner and back can be an important way to begin. Exercise can also help a new parent “drop into her body” and be in her body rather than her head which can be a source of mastery and perhaps even pleasure. Just as therapeutic holding is an emotionally and affectively based connection between a clinician and the person with whom the clinician is working, creating bonds and building bridges with others can be a truly effective way to break the isolation and shame that can result from experiencing perinatal emotional distress or a PMAD. Some women find talking to others helpful and might seek out groups focusing on these challenges such as those carried out by Postpartum Support International (PSI), which hosts both in-person and online groups. Other women may prefer not to revisit perinatal emotional distress and might find a more general “New Moms” group more in line with what they want. It can be useful to identify specific kinds of social supports. For example, Doka and Neimeyer (2012) describe three ways that people give and receive social support: “a doer, a listener, or a respite figure” (p. 315). The doer is the person a parent calls on when she needs to get something done, not when she wants to pour out her heart. The listener is the person she can call on for that. And, it’s important to remember to find ways for a new parent to have some “respite” or fun by perhaps going out with a fun friend for a cup of tea or to a movie or some other new adventure. Building bridges with others can be transformative and restorative and can remind a new mother that she is not alone. And, these affective connections can strengthen her understanding that she can be cherished, loved, and soothed and, therefore, that she can cherish, love, and soothe. And, through experiencing the affective connections in the therapeutic context, grounded in clinicians’ implicit love for those with whom they are working (and building right brain-to-right brain connections), new parents can move beyond just enduring life to the possibility of a lifelong love of life and loving life as parents. APA Presidential Task Force on Evidence-Based Practice. (2006). Evidence-based practice in psychology. American Psychologist, 61, 271-285. Doka, K., & Neimeyer, R.A. (2012). Orchestrating social support (p. 315-318). In R.A. Neimeyer, (Ed.). (2012). Techniques of grief therapy: Creative practices for counseling the bereaved. New York: Routledge. Schore, A. (2012). The science of the art of psychotherapy. New York: W.W. Norton & Company. Schore, A., & Marks-Tarlow, T. (2018). How love opens creativity, play, and the arts through early right brain development. In T. Marks-Tarlow, M. Solomon & D. Siegal, (Eds.) Play and creativity in psychotherapy. New York: W.W. Norton & Company. Winnicott, D.W. (1975). The child, the family, and the outside world. New York: Routledge. Pediatricians are in a powerful position to strengthen the mental health of the whole family.